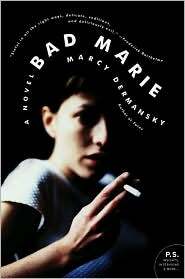 The sighing started about a third of the way into Marcy Dermansky's Bad Marie. What's that now? A fresh-from-prison nanny has nabbed her employer's husband and toddler and is off to France? Okay, if you say so. Oh, now they've met an unstable movie star? What a coincidence! And now there is a second movie star and the vengeful former employer is on the warpath and, for some reason, the main characters wind up in a dead woman's apartment with a mangy, half-starved cat? Good times! Clearly, I was not charmed by Bad Marie's plot. It was neither absurdist nor realistic, so its Lifetime Movie of the Week pulpiness made it seem like a grocery store paperback in a novel's clothing. But I will say this for Bad Marie ? its main character is one of the most grimly fascinating I've met in a long time. Marie has been gnawed at since childhood by a ravenous sense of inferiority, making her dangerously entitled and unable to deny herself what she wants regardless of the consequences. Marie is petulant. She is unstable. She is selfish and completely unmoored from reality. This deeply flawed, rotten-to-the-core character is what kept me from regretting reading Bad Marie. Dermansky writes about her with sympathy, so the reader is given double vision; it's obvious Marie is a poisonous influence on whomever she's around, but in her severely warped worldview, what she does makes sense. It's a clever trick; too bad Dermansky wasn't as clever elsewhere with her novel. I’m curious to know if you’ve ever actually read a grocery store paperback. I can get on board with the Lifetime Movie analogy because they can be compulsively watchable despite all logic. I found Bad Marie compulsively readable despite all logic. But even if you don’t like the plot, I don’t think you can make the argument that the writing is cliche-ridden, ham-handed, unimaginative dreck that is often found in grocery-store lit. Oh, Will. You’re just flat wrong.